What China-Train-Ticket Can Do for You and Your China Travel. We specialize in China train ticket booking and delivery service, standing ready to render personalized train tour services for you. Through the personalized train tour we arrange for you, you will embark on a brand new journey of discovering Chinese society. Along the way, as you sit on the train, you will catch glimpses of traditional Chinese culture. The compelling scenery will unfold in front of your own eyes through the train windows. 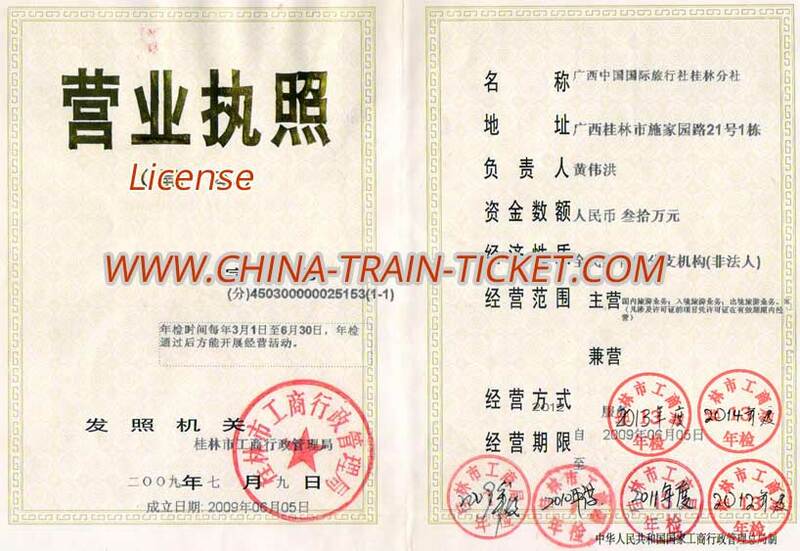 We are ticket experts in China and the China Train Ticket office affiliated to China International Travel Service Guangxi Guilin Branch (CITS Guangxi Guilin Branch), our license Number is L-GX-GJ00009. What can we do for your China train tour? 3. Evening show ticket booking and delivery services such as Kungfu shows, Peking opera performances etc. 4. Personalized train tour services, including hotel reservation, tour guide, car arrangements and sightseeing itinerary. Train ticket and extra potential service fee= ticket net cost + ticket booking service fee CNY5 per ticket + necessary personal consultation and 24 hours phone support service in English + USD5 per delivery if applicable + Paypal transfer fee 4% if applicable. China tour itinerary consulting fee: China tour itinerary consulting fee: USD10 per person for a single city tour, USD20 per person for 2 destinations tour, USD30 per person for 3 destinations tour, etc. 1. Collect it by yourself at a train station by showing your passports and booking number. If you choose to collet your ticket by yourself, there will be no USD5 delivery fee. 2. Delivered to a hotel address in China. 3. Delivered to a personal address in China. Why book a train ticket from us? 1. We can book your tickets within in a minute of your request depending on the ticket availability. You can collect them with a pick-up code and your passport at the train station right away. 2. You will have to wait in line if you go to the ticket office of the train station which, in most cases, is packed with people. This can turn out to be quite time-consuming. Also, when you reach the front of the queue, there is a possibility that the ticket you intend to buy has been sold out. There is also a possibility, considering the language barriers, that you may buy the wrong ticket. 3. We provide ticket booking services so that you can save time and avoid troubles. You can also book the tickets through the search engine of our website, and once you have made payment for the ticket you want on our website, we will endeavor to book the ticket for you. 4. 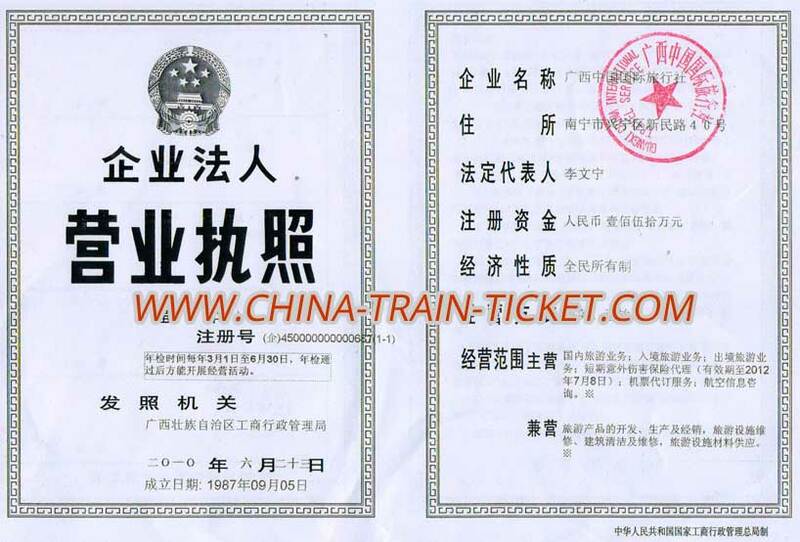 The ticket information we rely on is accurate as it comes from the official website of the National Railway Administration of the People’s Republic of China. 5. Ticket delivery service is part of the package for you. We will send the ticket to your hotel in China as soon as possible. This service will attract a small additional fee. 1. We don’t recommend booking train tickets during the holidays and festivals. On the one hand, it will be far from easy to book a ticket while on the other hand, the train station will be crowded to an extent that is beyond your imagination! 2. Chinese holidays and festivals: The Spring festival usually falls within the span between February 19 and 26, but the 20 days before and after the festival also witness great demand for train tickets. The International Labor Day Holiday is from May 1 to 7 and the National Day holiday from November 1 to 7. 3. During the holidays and festivals, it is hard to book a hotel and the price will be higher than usual.